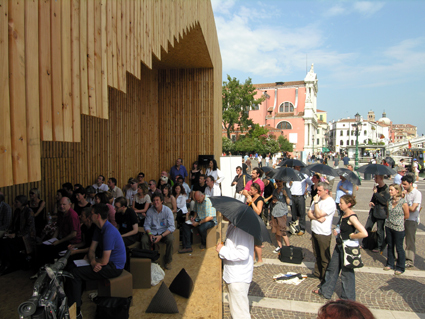 You are currently browsing the tag archive for the ‘biennale’ tag. 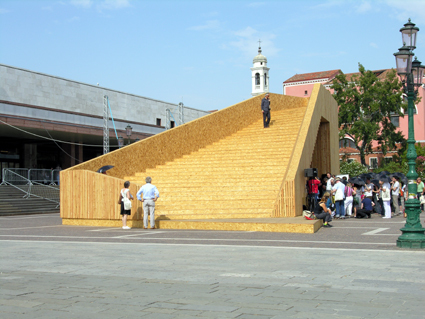 Scotland’s contribution to the 11th architecture biennale in Venice is shown in these photos by Gareth Kennedy. Titled A Gathering Place, it’s just that. Located close to the train station it receives lots of non-biennale visitors, and through careful siting, it functions both as a lookout and a shelter spot where discussions are held. Despite the ‘stairs to nowhere’ effect, it struck me as a very optimistic structure… and I really enjoy seeing such elegant use of sterling board.